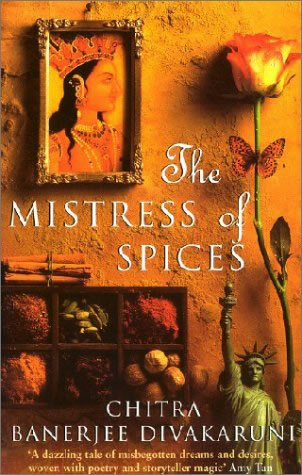 A first novel by the author of the short story collection, Arranged Marriage, The Mistress of Spices is a mystical tale told by Tilo, a young Indian woman in an old woman's body who has been trained in the secret powers of spices. Her special knowledge leads her to Oakland, California where she uses it to help the local Indian community by opening a spice shop from which she administers spices as curatives. Tilo can see into people's hearts and minds but it is a mistress's duty to keep herself at a distance, "not too far nor too near, in calm kindness poised." However, Tilo is unable to obey her charge, and she becomes emotionally involved with her customers as they struggle with the demands of their families, the clash of the old way versus the American way, racism, abusive husbands-all of the complexities of living in the modern world. It is also her duty to limit her involvement to the Indian community. But Tilo finds herself mysteriously drawn to an American man named Raven, whose innermost thoughts she cannot read. Her complex and passionate relationships with her customers and Raven are in violation of her spice mistress vows, and so she finds herself forced to choose between the magical of an immortal and the vicissitudes of life in the real world. Vibrant, vivacious, headstrong and daring, Tilo is unforgettable and so is her story." "Ms. Divakarunis stories are as irresistible as the impulse that leads her characters to surface into maturity, raising their heads above floods of silver ignorance." "Divakaruni's prose is so pungent that it stains the page, yet beneath the sighs and smells...she deftly introduces her true theme: how an ability to accommodate desire enlivens not only the individual heart but a society cornered by change."